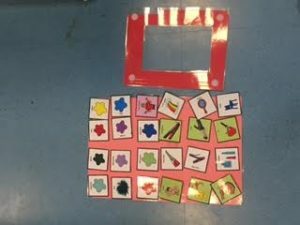 I often see people asking for ideas to teach language through play in AAC groups on Facebook. 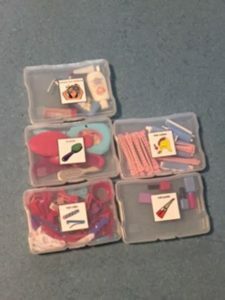 What I most commonly see as the suggestions are cause and effect toys like light up toys, wind up toys, sensory items, etc. Frequently people write that their students with autism aren’t motivated by play and I almost never hear about students with severe physical disabilities engaging in play other than to direct it using their talkers. I’ve thought a lot about this and came to the conclusion that this didn’t feel right. Why are we not providing our students with disabilities with the same play opportunities as their peers? With that in mind, I started to order toys for dramatic and pretend play. I started using them with lots of different groups of students and guess what, they ALL love them. Even some of my super tough to motivate to play, kids with autism are having a blast playing with these kits! The most important piece, I think, is that I facilitate the play and never expect to just leave the toys with a group of students and see them successfully play. It doesn’t always go smoothly the first time but it often does in subsequent sessions. I play with these kits in individual sessions or in small groups with no more than four students at a time. They are a HUGE hit. I promise! The first kit I decided to share is my hair salon kit. 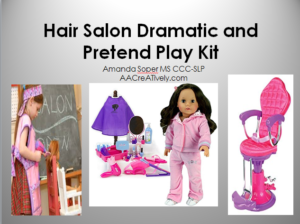 My SLP intern and I have had so much fun playing with this kit in sessions. It was our first “hit” and was loved by both boys and girls. 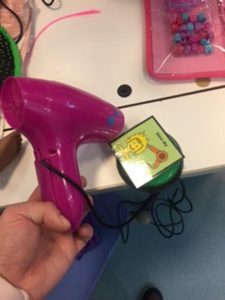 🙂 There are a bunch of accommodations so students with severe physical impairments can use switches to engage in pretend and dramatic play! Students can use an adapted pourer and switch to “wash” the doll’s hair. I attached velcro to the shampoo, conditioner, and a brush. Students can “braid” or “twist” the doll’s hair using an adapted pourer and a switch! I attached hard velcro on either side of the switch plate. If you press a doll’s hair tightly into the hard velcro it will stick. Then use the switch to have the pourer go around and around while it twists the hair! Students can cut the dolls hair using adapted scissors and a switch (or any kind of adapted scissors). I bought hair extensions (they were fairly cheap) and I let students cut the extensions so we don’t end up with dolls with no hair! Students can blow dry her hair using a Powerlink and switch. Here’s my PowerPoint with lesson ideas, accommodation explanations, etc. Everything in the kit is labeled for easy use! Icons are available along with an eyegaze board to accommodate students who need to make choices using pictures. These icons are also used to label the switch during switch adapted play. Here is a link to items I bought. Some of them were donated by a family member no longer using her American Girl doll items! How did you make the adapted pourer switch ? ?